Officials at the US Department of Energy are checking their roofs for some of that “low hanging fruit” available to increase energy efficiency in buildings. 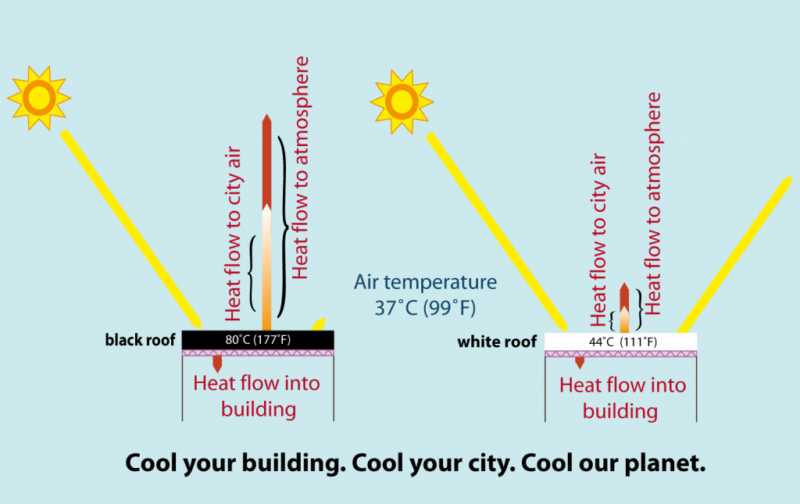 A study released this week by Lawrence Berkeley National Laboratory suggests that “cool roofs” have the potential to offset up to two years worth of worldwide CO2 emissions and reduce the effects of urban “heat islands.” If that’s the case, increasing the albedo, or reflectivity, of roofs and pavements might be the solution to hotter days in the city. Cool roofs use light-colored materials to reflect sunlight, instead of absorbing heat from the sun. According to the LBNL study, roofs and pavements cover 50-65% of urban spaces, most of which use dark colored materials. These darker materials have an amplifying effect when cities get hot. They contribute to urban heat islands, which can trap heat in cities for days. Dark surfaces also radiate more heat into the atmosphere, which is absorbed by clouds in the atmosphere. The study finds that dressing the city in lighter colors would lead to less heat being trapped by clouds. DOE is implementing the cool roof strategy as part of a federal commitment to reduce greenhouse gas emissions from government operations 28% by 2020. On Monday, energy secretary Steven Chu directed his and other and federal agencies to cool down their roofs. In the press release, Chu said “Cool roofs are one of the quickest and lowest-cost ways we can reduce our global carbon emissions and begin the hard work of slowing climate change.” The roofs will be installed on an as-needed basis to replace older roofs or newly constructed ones. Projects will get underway this summer, starting with DOE Headquarters in Washington. 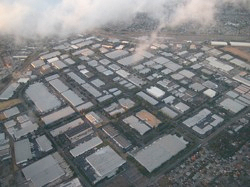 Currently slated cool roof projects will cover 350,000 square feet. One scientist we spoke with threw a little cold water on the concept, saying cool roofs do not match the scale of the problem. In Rosenfeld’s earlier paper on the benefits of cool roofs and pavements, he calculated that worldwide implementation could offset 44 gigatons of carbon dioxide. The LBNL study is a continuation of the same work, but was the first to use a NASA land surface model to calculate cooling effects and carbon dioxide offsets of cool roofs and pavements. Image from Lawrence Berkeley National Laboratory. Lol! Ok let me guess. The company which commissioned this bad study makes white paint; am I correct? Benjamin Moore or Pratt & Lambert or something. C’mon tell me. One thing to be aware of, is that a cooler asphalt roof will need a higher temp in order to self-seal. So fall is not the best season for putting one on. Addressing global warming by painting or placing white roof tops does not address global warming, pollution, loss of arable land, hunger, loss of species, and the millions of people who die yearly due to these combined “symptoms”. Good physicians treat the disease not the symptoms. Global warming and all the obove mentioned symptoms are caused by overpopulation. Until we finally face this elephant in the room, all white washes, be it roof tops or little adjustments of all the above mentioned symptoms merely postpone addressing the real problem, so much so, that the damage ultimately will be irreparable for mankind. Dr. Chu should life up to his part of physician, and address the disease: OVERPOPULATION, if he is to make a real difference. Please watch the video in this BBC recent report to fathom the enormity of the problem. BBC News VIDEO . See http://news.bbc.co.uk/2/hi/science/nature/8213884.stm. In the far right column on Climate Watch’s homepage, click on the orange rss logo (link). On that page, in the “subscribe now” box, you can add the rss feed using a variety of readers like Google or Yahoo’s reader.